Here are my Ulta3 mauves and purples (other than the ones already listed). I was out on the weekend and my local chemist had restocked their Ulta3 bin - YAY. I got another 20 Ulta3 polishes. I haven't had a chance to swatch them yet, but stay tuned. 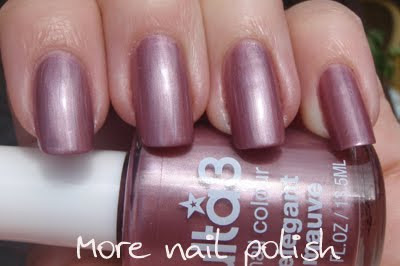 Yummy mauve - This was thick and gloopy for me to apply. This is more pink to me than mauve, but when compared to the Ulta3 pinks, it's definitely mauve. Three coats here. It has a nice shimmer, but also is a teeny bit streaky. Elegant mauve - is a dustier mauve colour. Again a nice shimmer and the streaks don't show as much in this one. This was two coats, but it applied think because, it too was gloopy. Sweet violet - isn't this one pretty. Nice to apply and looked really lovely on my nails, it think it just matched my skin tone perfectly. When I was writing my notes on my swatches, this is the one that I actually wrote 'really nice' next to. This was two coats. Purple passion - great colour but very sheer, this was three coats. Applied great and had a very sparkly finish to it. It's not streaky at all and would probably be great layered over black. Pearly grape - KAPOW, it kinda hits you in the face this one. The first Ulta3 polish that I would possibly call a duochrome. The light hitting the polish shows the great purple fleck, but on the angles you can see the deep pink/fuchsia. Looks so much better on the nail than in the bottle. I can't believe it took me this long to try this polish. This was three coats. 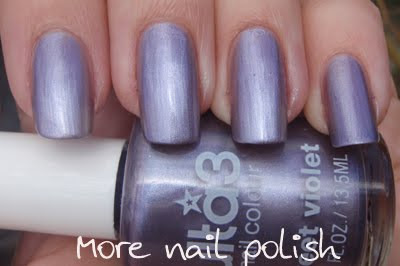 Sweet Violet looks really nice on you! The swatch almost looks matte! I've been playing around with my glitters and I've come up with something that I really love! It's got an OPI Mad As A Hatter look to it- super glitzy! It's almost holographic from afar! I used two coats of Candied Violet (a shimmery purple with silver glitter), one coat of Blue Glitter, one coat of Charmed, and finally a coat of Confetti. I tried using only one layer of Candied Violet, but I had bald spots on my nails which made it look really funny. Candied Violet was really gritty so a top coat was an absolute must. I think it would also look really cool to use Razzle as the base- I might try that one day. Gold Dusk - Pearly grape was not what I was expecting, much better than what the bottle looks like. Silentphrases - I don't think the sun was fully out when I took the first three pics. Your right, they all look a bit matte, but they were shiny. Great pics of your layered polish, I want to try it, but I haven't been able to find Candied Violet, I'll have to try it with Razzle. It looks like you found a really good use for the ordinary Ulta3 glitter polishes though!! Wow, those are all gorgeous! But I like sweet violet and purple passion the most!